More than half the world’s population now lives in towns and cities, putting pressure on current infrastructures. As a fast-growing city, Chicago wanted to harness enormous advances in technology to improve quality of life. 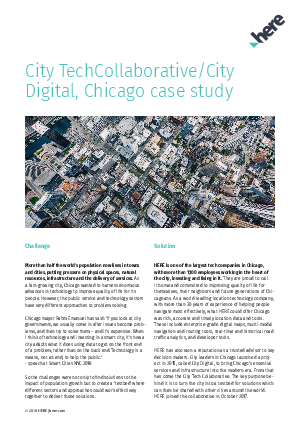 It created City Tech Collaborative/City Digital. HERE joined the collaborative in October 2017 and this case study takes a brief look at the solutions it has already worked on, including easing congestion on Chicago Cubs games nights. HERE is one of the largest tech companies in Chicago, with more than 1,100 employees invested in it. They are committed to improving quality of life for themselves, their neighbors and future generations of Chicagoans.